Raghunath Das (1495-1586) was the first of the six Goswamis to meet Chaitanya Mahaprabhu. Born in a small vilage of Sri Krishnapur in West Bengal, he belonged to a fabulously rich family of landords. His family were millionares, even in those days. Hussein Shah, the Emperor of Bengal leased the entire Saptagram district to Raghunath das' father and brother for an annual rent of Rs.12 lakhs. The family collected Rs.20 lakhs per year as taxes so even after paying the King, they had immense wealth. Raghunath Das was instructed in his boyhood by Balaram Acarya, a great scholar and an advanced devotee of the Lord. 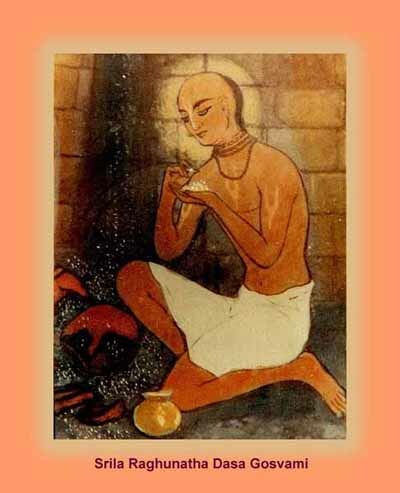 He introduced Raghunath Das to Haridas Thakur, the great Namacarya devotee of Chaitanya Mahaprabhu, who imparted a deep devotional spirit to Raghunath Das. At the age of 15, Raghunath Das heard about Chaitanya Mahaprabhu's visit to Shantipur after His taking sanyas and despite resistance from his parents, ran away from home to meet Him. His heart was completely melted by Mahaprabhu's beauty and charming Personality, His Devotion and His Teachings of Devotion for Krishna. Mahaprabhu Himself was also aware of this. Raghunatha would not leave Mahaprabhu, but the Lord told him, "Return home now. Don't be over-enthusiastic; control yourself. Keep your Divine Love for Krishna within your heart, and don't express it outwardly. Don't advertise it. Very soon the time will come when Krishna will call you. He will make a way out for you. Don't allow any external show but keep it within your heart." Raghunath das returned home. He was married to a woman said to be of exquisite beauty. However, having no interest in material life whatsoever, soon he began to live in the outer section of the house. Observing his son's increasing detachment in worldly matters, his father and other guardians thought that his condition had become very grave, so ten men were engaged to keep guard that he may not leave. Later he also met Nityananda Prabhu in Panihati. Nityananda Prabhu said to him, "Give a feast here for My followers. You are the son of a rich man, so please try to give a feast here for My followers." Raghunatha did so (the famous dhadhi-chida mahotsava) and Nityananda Prabhu was very pleased. He blessed him, saying, "Very soon your bright day will come." And He addressed His devotees, "See this young boy - he has immense wealth; in abundance he has everything required for a young man's enjoyment, but he does not care for it. Krishna's Grace has come down into his heart, so he does not care for anything of this world." One day in the early morning before sunrise, the family Guru, Yadunandana Acarya, suddenly arrived at the house. Finding Raghunatha in the outer section of the house, he met him and requested him, "I am going out for some important business, but there is no one to worship my Deity. So please ask a Brahmana disciple in my name to serve the Deity for a day or two during my absence." As Yadunandana Acarya walked out of the house, Raghunatha accompanied him. The guards saw him going with the family Guru, so they did not intervene. On the way, Raghunatha requested the Guru, "Please go ahead with your business, and I shall request a brahmana to do the worship in your absence." The Guru left. Raghunatha took advantage of the situation. After giving appropriate instructrions to a brahmana, he started off in the direction away from Puri. He knew that as soon as his family realized he was missing, they would send men to search for him on the road to Puri. So for the whole day he walked in the opposite direction. In the evening he stopped at a cowherdsman's house, took a little milk from him and passed the night in the cowshed. Then in the morning he started for Puri. When his guardians found that Raghunatha had not returned home, they heard from the guards that he had gone out with the family Guru. They went to the Guru's place, but Raghunatha was not to be found. Then they thought that he must have gone to Puri, and they sent men to find him there. They returned without finding him. In this way, Raghunatha cleverly managed to escape. For twelve days he walked to Puri, taking food for only three of those days. On the other days no food was necessary. He was helped by Divine Love, surcharged with bhakti. He had already heard that Mahaprabhu was at Gambhira, the Kasi Misra Bhavan. He went there, and in the courtyard fell flat in obeisance unto Mahaprabhu. Mukunda Datta announced to the Lord, "Raghunatha has come." Mahaprabhu said,"Good, look after him. He has come here with great difficulty, walking for days without food. Take care of him for a few days. Then, he will manage for himself." For a few days Raghunatha took prasad there. After that he began to beg at the gate of the Jagannatha Temple. The parents now thought it was impossible to bring him back, and they did not make any further attempt. But they sent some money with one Brahmana and two servants, instructing them to hire a house and offer Raghunatha a place to stay, and see that their son may not die without food. They tried their best, but Raghunatha continued to subsist on alms. Over a period of two years, Raghunatha invited Mahaprabhu to take prasad at that house, and the Lord did so for his satisfaction. After that, Raghunatha left that idea, thinking, "This is only to produce some name and fame for me. Mahaprabhu is not pleased with such Prasadam." Svarupa Damodara was the dearmost personal associate of Mahaprabhu and a very good scholar as well. Mahaprabhu gave Raghunatha over to the charge of Svarupa Damodara, saying, "I request Svarupa Damodara to take your charge, and he will advise you what will be necessary for your devotional life." Even though this was a great honour, it just made Raghunath Das all the more humble. He rarely approached Chaitanya Mahaprabhu directly, considering himself to be unfit to associate with Him. He served Swarup Damodar with great devotion, exemplifying the 'dasanudas' (servant of the servant) mood of a pure devotee. One day, Raghunatha approached Mahaprabhu and asked 'You have managed to make me leave home and hearth, but now what is my best benefit? If You please tell me in Your own words, my heart will be satisfied." Mahaprabhu told Raghunatha that this was the essence of His advice to him. Then, He again took Raghunatha's hand and offered it to the hand of Svarupa Damodara. He said, "I am giving you to the charge of Svarupa Damodara. He is the best Spiritual Teacher. He will take care of you." Appreciating his renunciation and devotion, Chaitanya Mahaprabhu gave him His personal shila from Govardhana Hill and a string of gunja mala. These were incalculably precious items, since they were personally with the Lord for more than three years. With passing years the devotion and austerities of Raghunath Das only increased. He would chant for twenty-two hours every day, sleeping for only one hour, and sometimes not even that. He gave up all food and drink, taking just a few drops of buttermilk a day. His fame as a mystic became so widespread that devotees from miles across would come to see him. With characteristic humility he would offer obeisances to each of the around two thousand devotees who daily approached him. He also offered one thousand obeisances to the Lord and chanted at least one hundred thousand holy names daily. His intense devotion and austerities attracted sages, scholars and spiritualist from far and wide. Raghunath Das Goswami stayed in Puri for sixteen years after which time Caitanya Mahaprabhu left the world. Two or three years later, his spiritual master, Svarup Damodar also left his body, and Raghunath Das Goswami, now forty years of age, following the last instructions of Chaitanya Mahaprabhu left for Vrindavana to assist Rupa and Santana Goswami in their mission to re-establish Vrindavana to its rightful position at the apex of all holy places. In Vrindavan, at the request of Rupa and Sanatana Goswami, Raghunath Das Goswami would spend two hours every day recounting the pastimes of Chaitanya Mahaprabhu. As the legend goes, Raghunath Das Goswami would spend several hours on the banks of Radha-kunda, completely absorbed in his meditation of the Divine Couple. On one occasion, Sanatana Goswami witnessed Sri Krishna Himself was guarding His devotee from a pair of tigers that had come to drink in the Radha-kunda. On another occasion, Sanatana Goswami saw Srimati Radharani, drenched in transcendental perspiration, smilingly holding Her veil to shield Her devotee from the intense afternoon sun. Considering themselves to be the servants of Srimati Radharani, Sanatana Goswami chastised Raghunath Das Goswami for taking service from their Masters. He asked him to build a small hut for his protection, which Raghunath Das Goswami complied with. This would start the tradition of building bhajan-kutirs by devotees to chant and meditate in isolation. Das Goswami was also instrumental in getting Sri Radha and Shyam Kund deepened, enlarged and renovated. Das Goswami wrote deeply profound verses about the pastimes of Radha-Krishna. 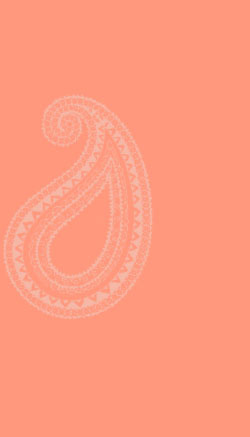 These have been compiled into the Stava-mala, Dana-charita and Mukta-charita books. Beyond his literary accomplishments, he is best remembered as the very emblem of renunciation. He was totally detached from material enjoyment and is appropriately known as the prayojana acarya, one who teaches by his own example about the ultimate goal of life. He lived a long life and met with Srinivas Acharya and Sri Jhanava Mata when they visited Radha Kund. Raghunas das Goswami entered into the Divine Couple's eternal pastimes on Shukla Dwadashi in the month of Padmanabha in 1586 (corresponding to 23rd October). 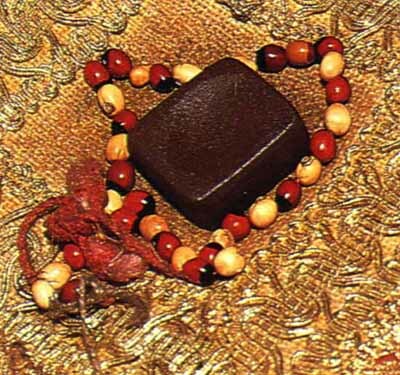 The tithi also marks the teerobhav of Srila Raghnatha Bhatta Goswami and Srila Krishna Das Kaviraj Goswami, the author of Sri Chaitanya Charitamrita. In Vraja leela, Srila Raghunath das is identified as Sri Rasa Manjari or Bhanumati, one of the principal manjaris engaged in the intimate service of Sri Radha. 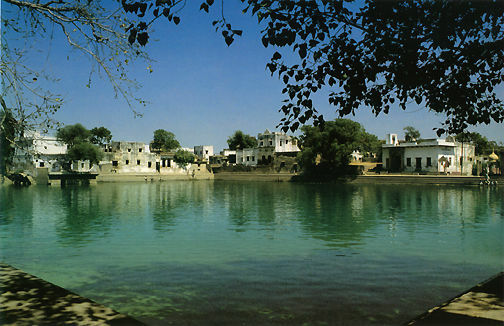 His samadhi lies in Sri Radha Kund. Sri Sri Raghunath Das Goswami Maharaj ki Jai ! !